Select an electric toothbrush with small, round, rotating head, as this style makes it easy to brush those hard-to-reach areas, and the rotating action mimics the ideal brushing motion. You’ll find many electric toothbrushes designed specifically for children at your local Shopper’s Drug Mart and most other pharmacies. Select one for your child based on the age range on the package. Introduce your child to the electric toothbrush before she has to use it. Show her how to turn it on and off, how to rinse it thoroughly, and how to place it on the charger. 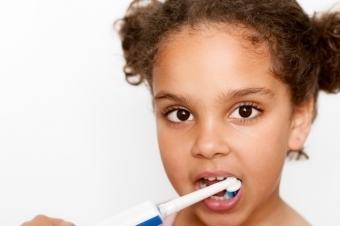 Smaller children may feel a little intimidated by the electric toothbrush at first. If this is the case with your child, let her turn the brush on and hold it against her hand, so that she can see that it is soft and gentle, and not scary. Ask your child to imagine her jaws have 4 quadrants, or sections. Top-Left, Top-Right, Bottom-Left, and Bottom-Right. That means that for a 2-minute brushing session, each quadrant of teeth gets 30 seconds of brushing. Depending on your child’s age, you can use this for a mini math lesson! Apply the toothpaste, and place the electric toothbrush head horizontally against the teeth. Then, turn it on and move it slowly along the gum line. Very little pressure is needed; let the brush do most of the work! Spend a few seconds on each tooth, and angle the electric toothbrush to clean the interdental areas (between the teeth) as you move along. Be sure to brush the front, back and chewing surface of each tooth. Spend a little extra time on the backs of the lower incisors (the bottom front teeth), as plaque builds up readily in this area. Don’t forget to brush the back surface of your back molars; the small, rounded head of the electric toothbrush makes cleaning this area much easier! Replace your electric toothbrush head regularly; 3-4 times a year is recommended. If you have question about teaching your child to use an electric toothbrush, contact our Burnaby children’s dentists today!